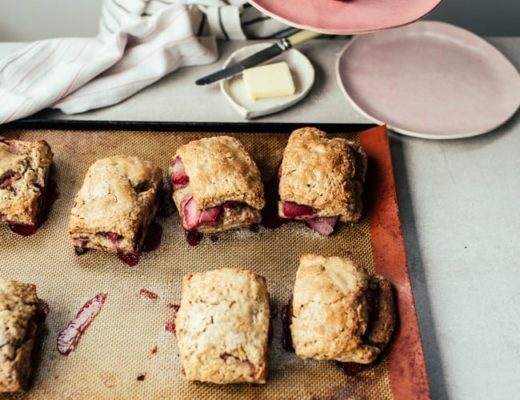 A quickie recipe for a cosy, filling brunchy dish today! 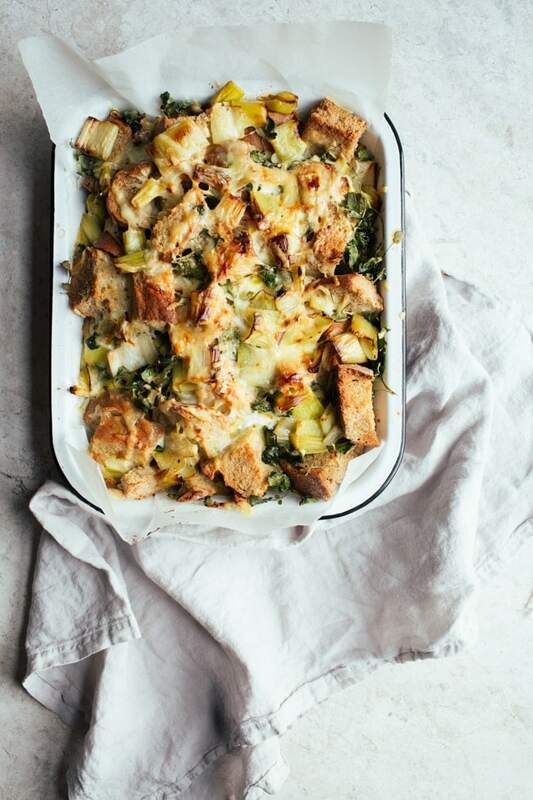 ..that’s what we’ve got here in this savoury bread-pudding-type-thing, also known as a ‘strata’. 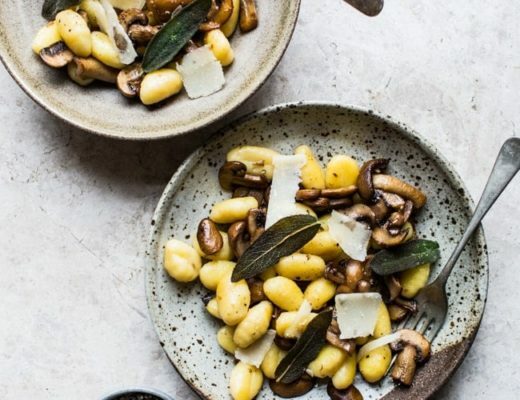 It’s incredibly easy to throw together and will feed a crowd so it’s perfect as a brunch dish for you and your mates. When the weather starts getting colder, I crave super comforting dishes like lasagne and PIE! But they’re both quite time consuming to make. 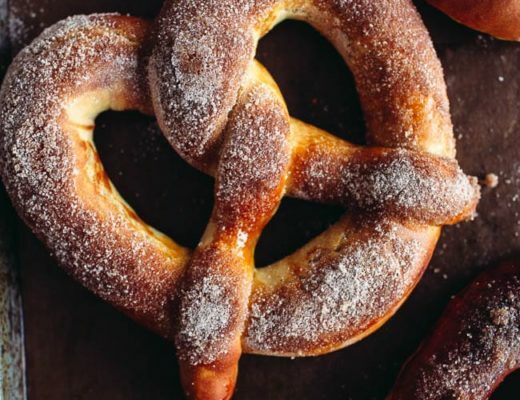 This recipe though is quick and really hits the spot. There’s just something cozy about the combo of slow-cooked leeks and cheddar cheese. 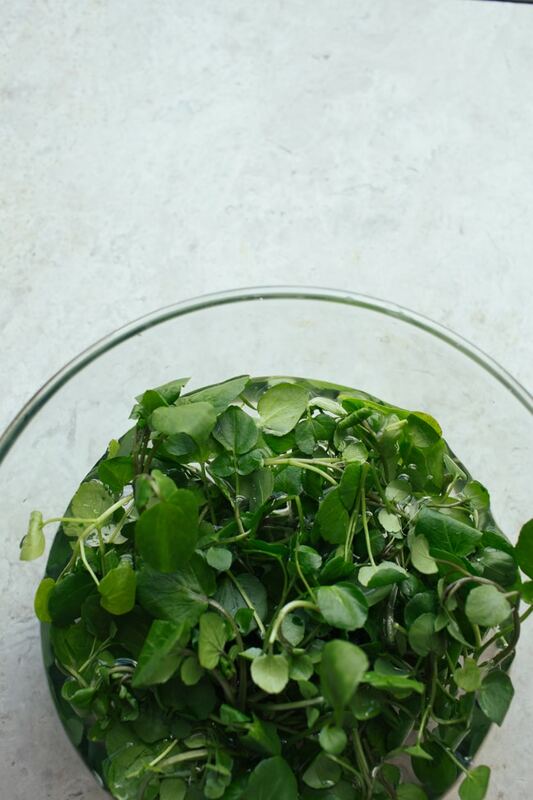 There’s peppery watercress tossed in too for a bit of bite and colour – no need to cook it first as the watercress will wilt down when baked and the bread will absorb an excess moisture! I even like to save some watercress to garnish the dish with after it’s baked as those cute little leaves are just so pretty. Bonus points for this recipe are for the fact that yes, you can assemble it in the evening, leave it in the fridge overnight an bake it in the morning… you might say it’s even better this way as the bread gets a proper chance to soak in the liquid and the flavour of the leeks infuses more. Leftovers (if there are any!) can be reaheated either in the oven OR my preferred method is to scoop some into a waffle iron and cook it in there so it gets mega crispy. Top it with a poached egg and you’ve got lunch sorted. Cut the leeks into roughly 1cm thick coins. In a large frying pan, heat the oil over a medium heat. Once the oil is hot, add the leeks and a generous pinch of salt to the pan then turn the heat down to medium-low. Let the leeks soften and try to avoid letting them colour, stirring often for 15-20 minutes. Add 60ml of water and stir until evaporated. Remove from the heat and set aside. Cut the bread into roughly 3cm chunks. 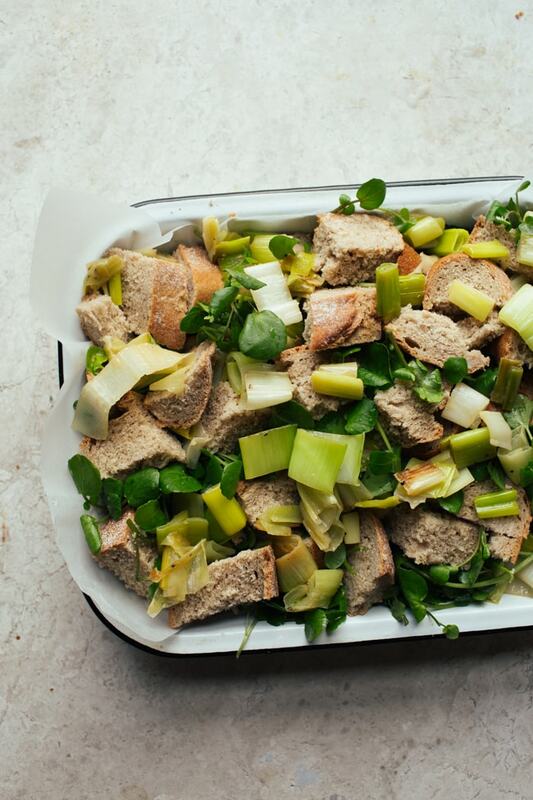 Layer the bread cubes with the watercress and cooked leeks into a medium roasting tin or casserole dish. Sprinkle over the grated cheese. Whisk together the eggs, milk, stock and a few grinds of black pepper. Season with a generous pinch of salt if you’re using low/no-salt stock. Pour this mixture evenly over the bread in the roasting tin. Let it sit for a few minutes then bake in the preheated oven for 35-45 minutes until dark-golden. *thanks to Wild for Watercress for sponsoring this post! All opinions are my own. This looks truly delicious 🙂 Proper winter warmer! I like everything that is in it! Savory bread puddingy thing, get in ma belly pleeeeeeease kthx! 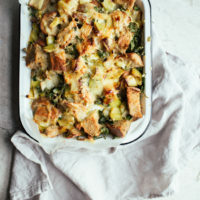 Savory bread pudding? Yeas, please! !